If you’re an iPhone user, then it is bound for you to get interested in photography, as for a fact that most of the Flickr users are iPhone owners. While the raw photos from iPhone may be good for some users, but there is always a room for improvements. Like the camera on the iPhone is getting better and better with every generation, the editing tools available on the App Store are also improving a lot. The great iPhone apps paired with some great photo editing apps would let you instantly share your photos on the social networks. We have made a list of top 5 best photo editing apps that you could install on your iPhone. The Pixlr covers your photo editing needs with everything from basic cleanup, cropping, and resizing, to more specialized tools and effects, offering your photos a little extra punch. You also get tools like auto-fix, one-touch cleanups, red-eye removal, as well as teeth whitening. The overlays and lightning effects would make your captures more dramatic if you want, whereas the fine-grained control is available via color adjustment tools. The Photo Editor by Aviary comes with a host of features available in simple slider bar interface for easy navigation. You get the features like cropping, orientation, brightness, contrast, sharpness and color warmth sliders for image-wide editing. With the one-touch tool, you can sharpen, illuminate, and automatically adjust the balance colors. Moreover, you can also manipulate the focus for tilt-shift effects. Other tools include a selection of frames, stickers, and filters. Remember, you can always purchase more options if these aren’t enough for you. This app is often said to be the most powerful photo editing tool available for iOS devices. The reason behind that is the extensive editing tool available in the app. Ramped up with great choices of essential adjustment tools; this app offers a good improvement of colors and exposure such as brightness, contrast, and saturation. Apply these adjustments to the whole image, or just a part of it by using the Selective Adjustment tool. The app also offers a good selection of effects and filters such as black and white, vintage filters, vignettes, textures, and frames. This isn’t just an editing app; you can use this app as your camera app too. 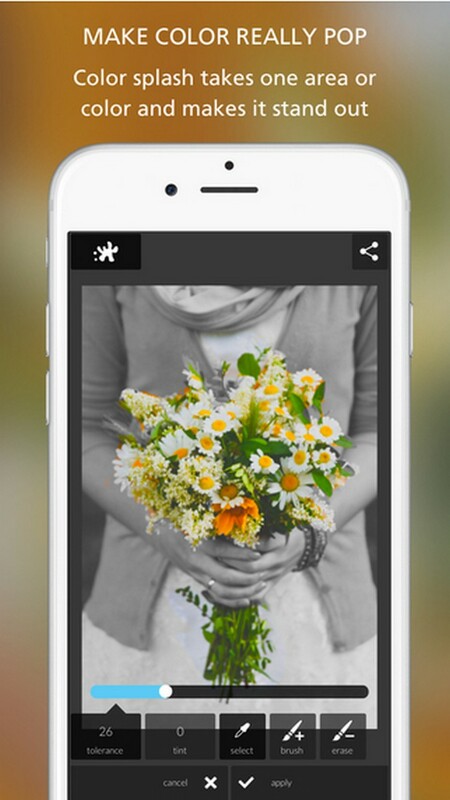 With great tools, this app allows it users to have some of the best photo enhancements available. The app has a clean and user-friendly interface containing both the filters and adjustments. 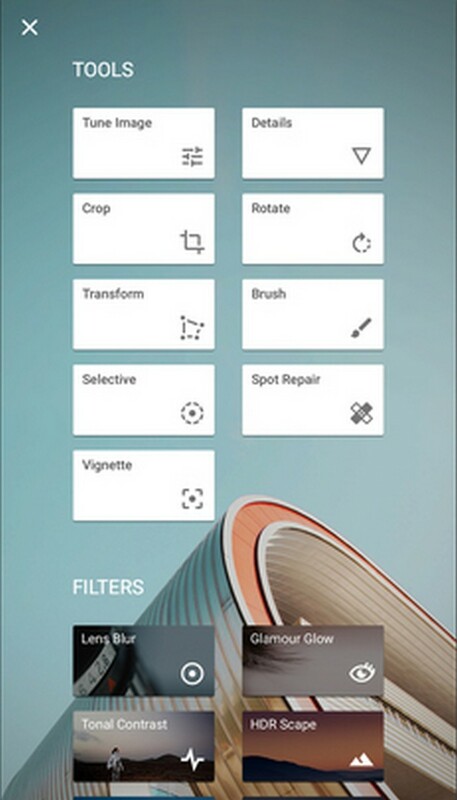 The app offers a quite amazing set of filters; moreover, you can also download additional bundles of filters. The filters in this app are very subtle and easy to the eye. Unlike most of the app, the filters on this app tend to give a bona fide film effect. This is a good tool for people looking to get an artsy touch on their captures. It features the requisite rough and fast image filters. Though, what makes it stand out among the other apps is that you can selectively paint on special effects using custom effect brushes with your fingertip. The interesting advantage for Samsung Galaxy Note owners using this app is that it supports the S-Pen. You could easily use the S-Pen to doodle around the capture. It comes with a variety of filters, brushes and frames to use professional photos.